I’ve been a Pilates student since 2007 and just fell in love with it. After taking classes for years, I quit my full­time job to be a stay at home mom. 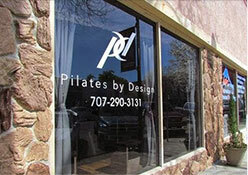 I decided to bring my love of Pilates to others in 2010 when I became a BASI certified Instructor. I love working at Pilates by Design in a beautiful studio where people can come to be healthy and happy with what the studio has to offer. I love to make my clients work hard and break a sweat. Through hard work we can all become stronger and more fit!